Every morning, a chorus of cheers and applause greets the students of Miami Northwestern as they start the day at Liberty City’s landmark high school. Against the neighborhood soundtrack of gunshots and sirens, the early morning pep rally led by City Year volunteers is unabashedly bubbling with positivity. For sure, some of the sleepy teens walking past roll their eyes. But plenty stroll in with smiles. A few even break out in a dance, right there on the school’s doorstep at 7 a.m.
It’s a great message for students anywhere. At Miami Northwestern, the educational rally cry competes with a lot of adult-sized distractions: poverty, crime and the stigma of academic failure. Today, there are signs that a transformation is underway at Miami Northwestern Senior High. The school began 2012 with a huge step forward – its grade improved from a D to a B. Graduation rates are up. Discipline problems are down. Reading, math and science scores are steadily improving. The posters up and down the corridors read: “The Pledge: 100% Graduation.” A new principal, Wallace Aristide, is setting new ground rules for learning, discipline and school culture. 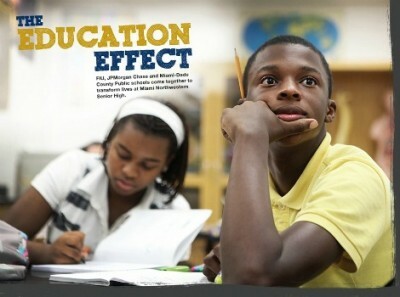 The partnership is called “The Education Effect” and it is unlike any ever initiated at FIU – bringing together the intellectual resources of a research university, the investment of a major corporation, the commitment of the nation’s fourth largest school district and the dazzling potential of 1,750 young minds. The announcement of the partnership was held in the Northwestern College Resource Room with its alumni hall of fame. Each successful Northwestern graduate is a reminder of the powerful effect education can have on a life. U.S. Congresswoman Frederica Wilson. Eleventh Circuit Court Judge Rodney Smith. FIU graduate and Tampa Bay Buccaneer Anthony Gaitor. Harvard University biomedical engineering major Jennifer Arzu. Sophomore Marcus Postell carries his assignments in a Captain America folder and keeps a pencil tucked behind his ear all day. A resident of Opa-Locka, Miami Northwestern is not his zoned school. He and his parents chose Northwestern. Like many Northwestern families, the Postells have been graduating from the school for generations. The high school has a strong and active alumni association and Bull pride runs deep in Liberty City. Among Northwestern’s graduates are Marcus’s sister, now studying pharmacy at the University of Florida, along with his father, aunts, uncles and grandmother. “I had to keep the family tradition going,” Marcus says. He is in Northwestern’s performing arts magnet program, as well as the FIU dual enrollment program for computer science. Through dual enrollment, he is taking a class with an FIU professor and earning college credit in his second year of high school. College is in the plans for Marcus. He wants to be a computer engineer or a physical therapist. He’s involved with a half dozen school clubs and is applying for the National Honor Society. There are two worlds at Miami Northwestern, says Principal Wallace Aristide. The school’s popular arts and medical magnet programs draw students from around the county. These high performing students like Marcus have a positive influence on their peers, Aristide said. Their parents, people like Mrs. Postell, have bought into Miami Northwestern. So, alongside the magnet students is a larger group of low­ – performing students. They are kids scoring at level 1 or level 2 on the state assessment exams. The scale goes up to a 5; a three indicates the student is performing at his or her grade level. That means some high school students are reading at a fourth, fifth or sixth grade level. A few don’t know how to read. Teachers at Miami Northwestern face the enormous challenge of trying to bring students who have fallen behind up to grade level. Closing that gap is one of the keys to raising Miami Northwestern’s overall school grade. Mrs. Postell is more interested in her children’s grades than the school’s grades. Miami Northwestern has been a great choice for her family. In early 2011, the Children’s Aid Society National Center for Community Schools held focus groups at Northwestern as part of the development of the new partnership. Teachers, students and parents offered up a laundry list of problems and challenges: Not enough textbooks. Outdated technology. Chronic student absenteeism. Lack of parental involvement. Teasing and bullying. Emphasis on football rather than schoolwork. Disruptive students. Inadequate transportation. Miami Northwestern is one of Miami-Dade County’s 26 persistently low performing schools in the district’s Education Transformation Office – or ETO, as it is called. Now in its second year, the aim of the ETO is to raise student achievement in these schools. Vitti, who heads the ETO, says it can take three to five years to turn around a high school. Graduation rates among the ETO high schools have improved an average of 10 percent and Miami Northwestern’s went up 8 percent from last year. For FIU Vice President Divina Grossman, the reports on Miami Northwestern were eye opening. She heads the FIU Office of Engagement, established in 2010 to lead and develop the university’s community partnerships. The creation of the Office of Engagement heralds a new era for the university, one that prioritizes collaboration to solve community problems. As Grossman read the reports, she found herself thinking about Liberty City’s problems of poverty and violence. A high school cannot be isolated from the community where it lives. In Liberty City, the median household income is $18,000 and as low as $12,667 in one area. The U.S. poverty level for a family of four is $22,350. Some 40 percent of residents didn’t finish high school and 38 percent are unemployed. The A&E real-life crime drama The First 48 is filmed right across the street from Miami Northwestern. “A lot of those were our kids at one time,” Aristide said. Every two weeks or so, Miami Northwestern goes into lockdown because of shootings in the surrounding community. During that time, everything and everyone at the school comes to a stand still – even if one period ends and the next begins – until police clear the neighborhood. The lockdowns sometimes go unnoticed. Other times, they disrupt everything. The principal quietly keeps tabs on the kids without parents and the ones without enough to eat at home. For some of them, Aristide says, school is the only consistency in their lives. No single program, person or organization will be able to address all of the challenges at Miami Northwestern Senior High School. There are upwards of 20 different organizations like Arts for Learning, City Year and College Summit already working there. Towards the end of 2009, JPMorgan Chase approached FIU about the use of the community school model, which has worked successfully in other parts of the country. JPMorgan Chase was interested in funding a pilot in Miami. They found an inspiration for how it could work in Philadelphia. The University of Pennsylvania’s Netter Center for Community Partnerships has been widely recognized for creating a new vision for university-community relations. The center mobilizes the university’s resources to transform local schools in a reciprocal relationship that provides college students with meaningful learning experiences. Penn has eight university-assisted community schools. The community school model makes a lot of sense to Grossman, a nurse who has worked to address health disparities by examining all the factors that influence a person’s health. “It is a very holistic approach that looks at conditions of learning such as meeting health needs, ensuring the safety of students, engaging parents and community members and preparing teachers.” Grossman said. It is not enough to teach well and make sure teachers are prepared, she said. FIU President Mark B. Rosenberg said the university is ready to get to work with Northwestern parents, students and teachers. In the Education Effect, FIU will take a leading role in bringing together community partners, particularly those already working at Northwestern, and other Chase grantees. The hope is that over time, the partnership will grow by attracting more community organizations and funding partners. The Northwestern partnership is fostered in part by a broader initiative with Miami-Dade County Public Schools called ACCESS, or Achieving Community Collaboration in Education and Student Success. ACCESS encompasses programs focused on minority education, teacher training, tutoring, academic leadership development and college readiness. Taking a cue from the Netter Center model, the Education Effect will utilize service learning to link FIU courses and research with real-world problem solving. The university will identify existing service-learning classes and develop new ones that will put FIU students in Miami Northwestern. Faculty and students from environmental sciences, education and business are already working with Miami Northwestern teachers, students and parents. FIU wants its students to emerge from service learning with an understanding of their role in democracy, Grossman said. Northwestern students will also have the opportunity to spend time at FIU, studying and learning about college life from FIU students. The grant supports the expansion of dual enrollment, which allows high school students to take FIU courses for college credit. While that is not going to address the challenges the school faces with the lowest performing students, it will benefit many students in the middle. The Netter Center model views schools as community hubs that can effect change across neighborhoods and cities. Aristide believes Miami Northwestern is such a school. 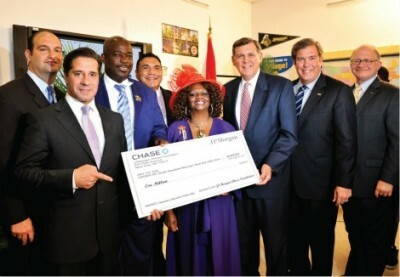 At the September announcement of the new partnership, a little lady in a purple dress and a big red hat stood with FIU’s president and the Miami-Dade superintendent during the presentation of an outsized $1 million check from JPMorgan Chase. School Board member and educator Dorothy Bendross-Mindingall grew up in the Liberty Square housing projects and graduated from Northwestern. She opened her remarks in fearless fashion: “If you are in this room and it’s not about children, you need to vacate the premises.” Then she gave the audience a talking-to about what it will take to make this partnership work — involving clergy, working with parents and spending time in Liberty City neighborhoods. As this partnership unfolds, FIU will have many longtime and passionate Liberty City and Northwestern advocates like Bendross-Mindingall watching. Liberty City has seen many years of well-intended programs and initiatives that wither after early success, said FIU alumna Alison Austin MS ‘96, who was raised in Liberty City and is now the CEO of the historic Belafonte TACOLCY Center in the heart of Liberty City. Austin, who was involved in the early planning for the grant, says she is cautiously optimistic about the new partnership. What’s needed, she said, is willingness to honestly confront Liberty City’s problems. The one thing everyone agrees on is this: The partnership with Miami Northwestern must be for the long term. The progress everyone seeks will take a number of years and the efforts of many. Mentors can make a world of difference for Northwestern students, said FIU alumna and Northwestern reading coach Cheryl White-Lindsey ‘98, who is now earning a doctoral degree at FIU. There is serious and impressive instruction going on at Miami Northwestern Senior High every day. You will not slack off in Rachel Hazel’s geometry class. When you walk out, you’ll know the difference between a rhombus and a trapezoid and soon enough, you’ll be solving geometric equations, too. A 2004 FIU alumna, Hazel warned her students at the beginning of the semester that geometry was going to get harder. “No, I won’t,” said a dubious Taylor. Yes, the teacher said. You will. No one argued with her. Five years later, Aristide is a first-year principal. Now if the kids are in the hallways, they have a pass. He promotes self-discipline, making good choices. Northwestern teacher Melissa Phillips is all about making good choices. Her 10th grade writing class is FCAT ground zero. On the back wall is a big sign: “BIG GOAL: 100% FCAT Proficiency Rate.” With a goal like that, there’s no time for foolishness in her class. When a student asks what time class is over, she’s quick with a reply. Phillips has a routine that the kids know well. It’s a spoken-word styled lecture, delivered amid a lesson on writing a good essay hook. Celebrating the new partnership last September were Nikolai Vitti, regional superintendent for the MDCPS Education Transformation Office; Miami-Dade County Public Schools Superintendent Alberto Carvalho; Miami Northwestern Senior High Principal Wallace Aristide; JPMorgan Chase Foundation Vice President Jesus “Jesse” Leon ; Miami-Dade County School Board member Dorothy Bendross-Mindingall; JPMorgan Chase Florida Chairman and former U.S. Sen. Mel Martinez; FIU Board of Trustees Chairman Albert Maury ’96, ’02; and FIU President Mark B. Rosenberg. Aquaponics Laboratory: Students will learn sciences, math and engineering in the new Northwestern aquaponics lab, which cultivates plants and aquatic animals in a symbiotic environment. Dual Enrollment: Up to 550 Miami Northwestern students will have the opportunity to chose from 11 FIU courses and earn college credits. Panther Day: FIU will host the entire student body of Miami Northwestern to attend college classes, learn about academic programs and become familiarized with college admissions. Financial Literacy: The College of Business Administration will expand its program that brings high school students to FIU to learn about finance, credit, savings and investment. Service Learning: FIU will develop new courses that integrate service learning at Miami Northwestern as part of the curriculum. An excellent idea and kudos to this collaborative partnership! How long will it take for the “education effect” to take root and change this scenario?